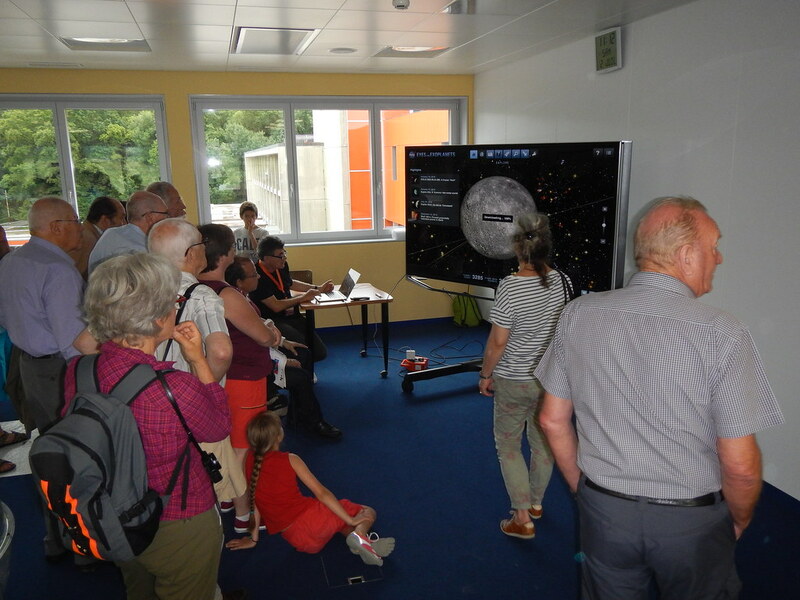 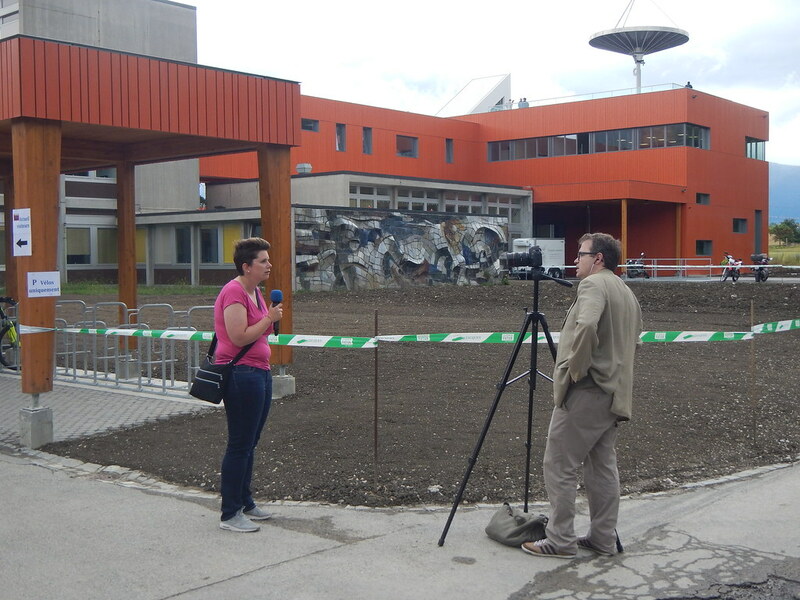 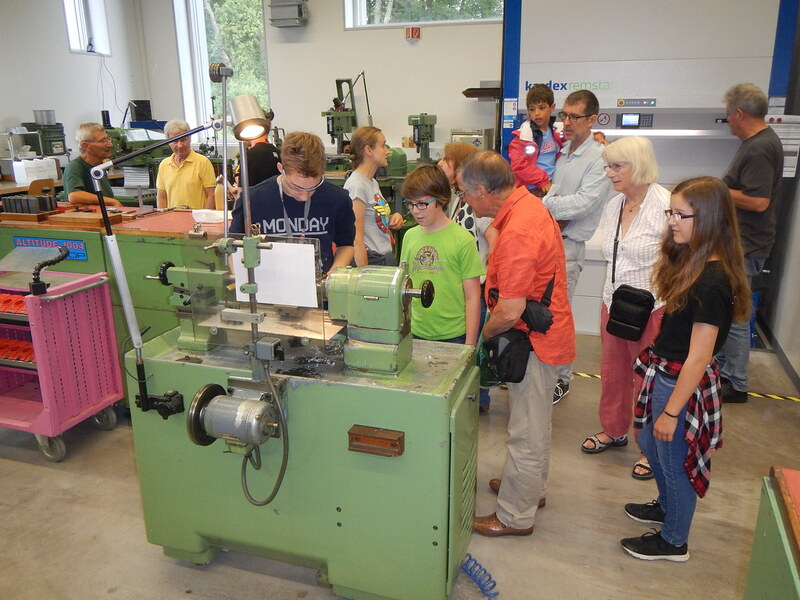 The morning rain and afternoon clouds on Saturday 2nd July 2016 did not discourage some 1200 visitors from discovering Astrotech, the new building of the Astronomical Observatory of the University of Geneva, officially opened five days earlier. 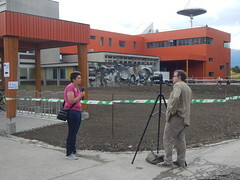 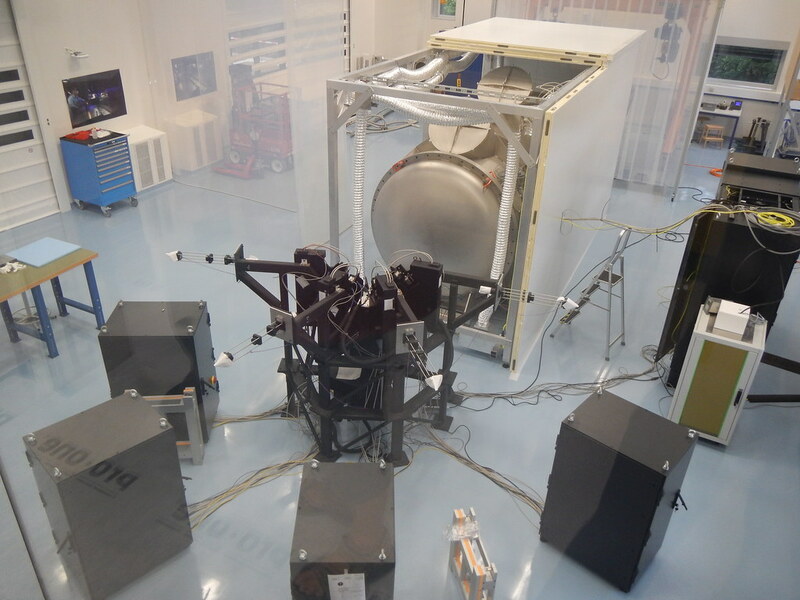 An important event for PlanetS since it is in this new building that members of the NCCR and the CHEOPS data center will be installed. 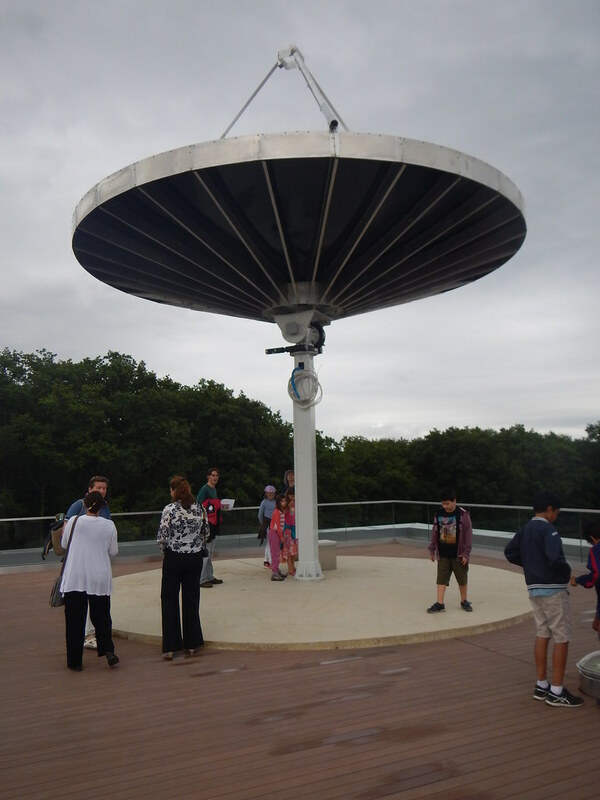 The Observatory employees were invited to welcome the steady stream of visitors during that day. 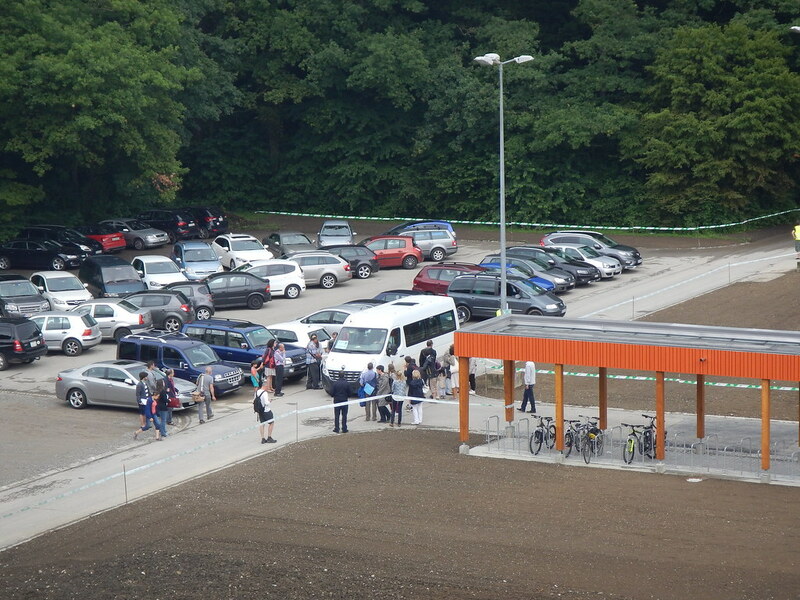 Part of the technical staff had to channel the flow of vehicles and when necessary to transfer them to a secondary parking linked by a shuttle. 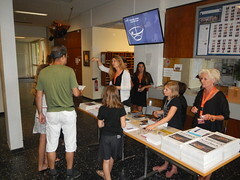 The visitors’ welcome was provided by the administrative staff who indicated the direction of the visit and provided all information related to the new building. The tour started with a film called “life elsewhere” which had been shown during the exoplanets exhibition at the Geneva Natural History Museum. 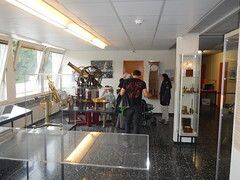 Before entering the new building through the gallery linking the two buildings, the visitors could discover a small museum where former observatory instruments were exhibited. 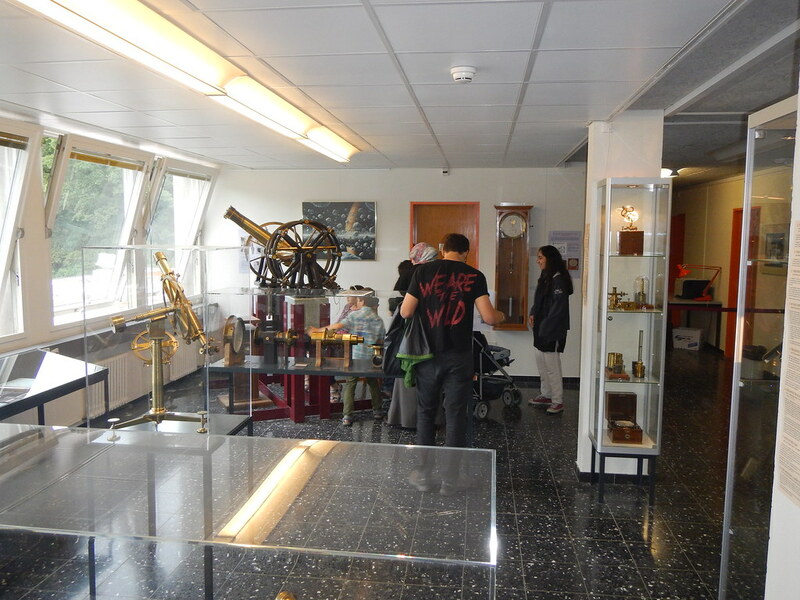 Inside Astrotech the academic staff had prepared several activities linked to the various lines of research made at the Observatory. 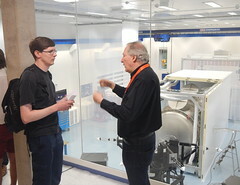 For example a “space-timetable” showed how space was modified by the presence of lead. 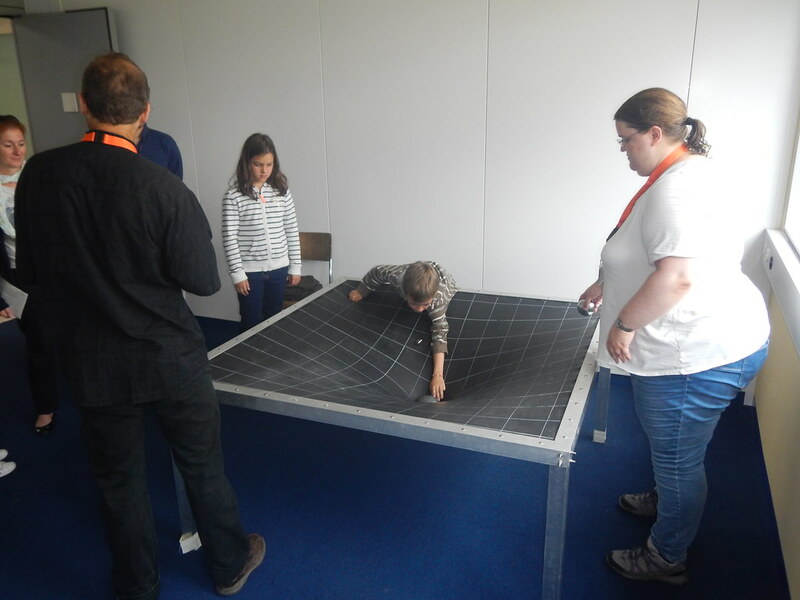 As demonstrated, a rubber tray table was deformed by a 10kg lead mass. 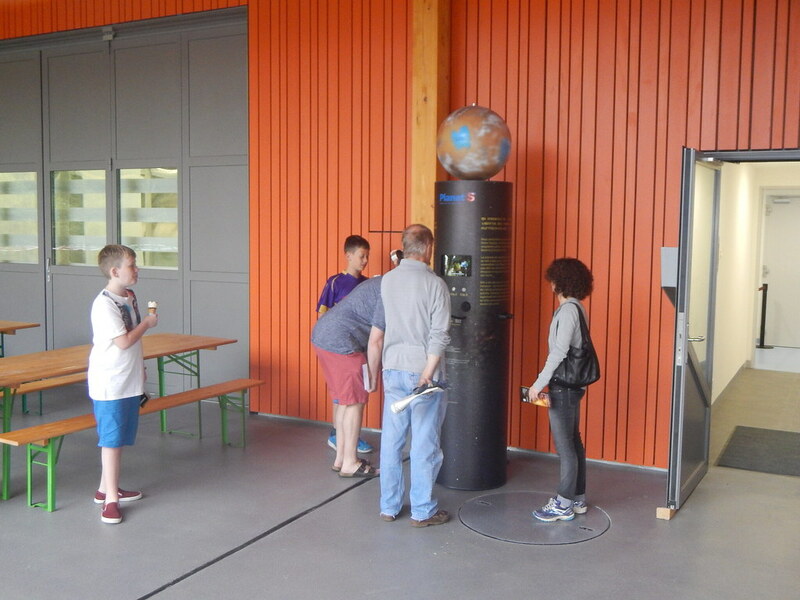 This animation was very popular among children as they could throw small balls towards the lead and could see how the trajectory of the ball was affected. A special box also simulated the gravitational lens effect by reproducing the deformation of the light beams due to the presence of a large mass in their path. In the large meeting room a replica of the Drake equation reminded the fans of the presence of intelligent life in the galaxy. 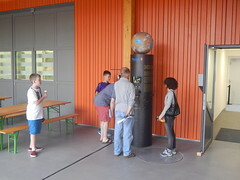 Each term of the famous equation was represented by a small bag containing blue and red balls of which numbers reproduced the probability existing in the term in question. 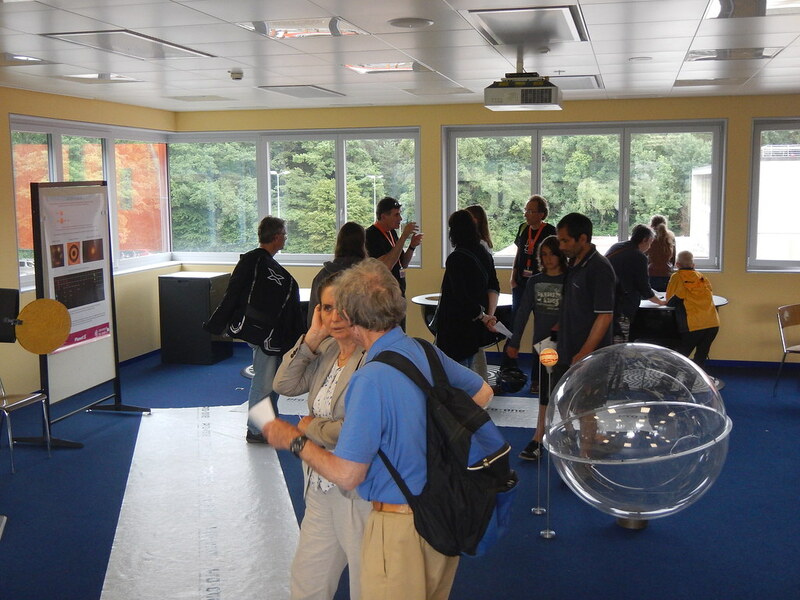 Finally, in the same room a small exhibition on exoplanets together with a model of the CHEOPS satellite were displayed. Visitors were then invited to join the gallery one floor below where they could have a bird’s-eye view of the clean room and ESPRESSO. 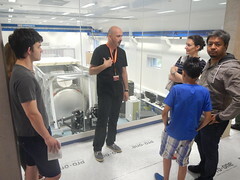 The engineers gave the visitors an opportunity to view the ESPRESSO tank as well as the front end which had arrived at the observatory a few days earlier. 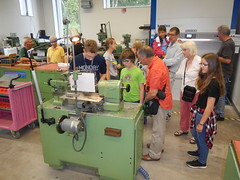 On the other side of the gallery, one floor below, people could discover the mechanical workshop recently moved to its new premises. 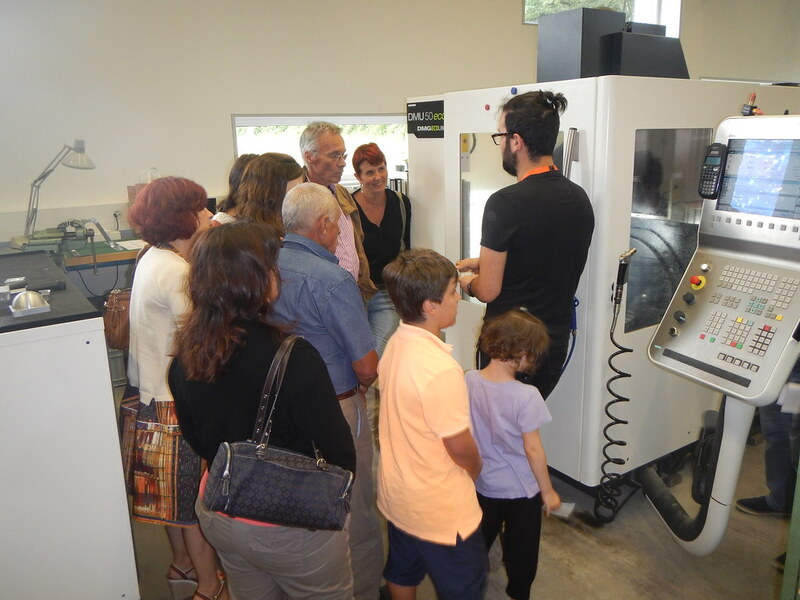 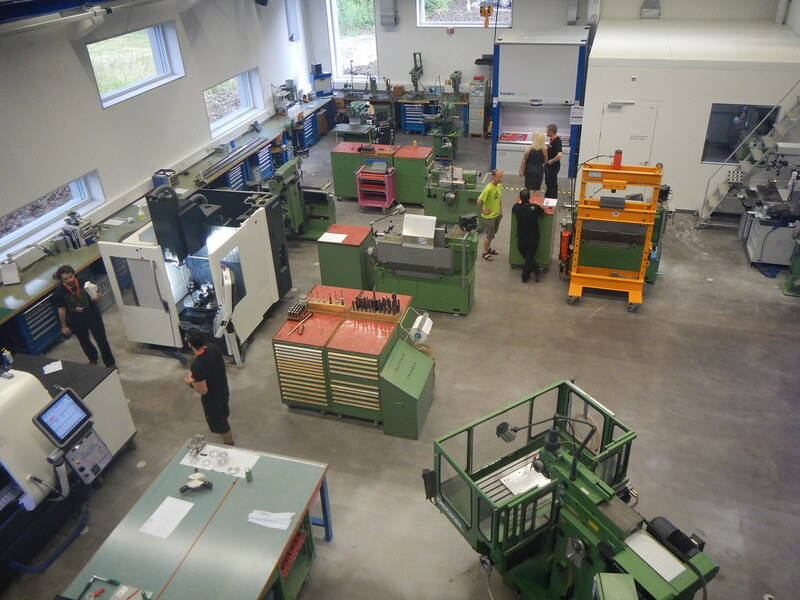 The visit of the workshop proved to be also a great success thanks to the technical staff who had prepared spectacular demonstrations for the occasion. People who had completed the tour had the opportunity to enjoy food and drinks at the refreshment area set up for the day. 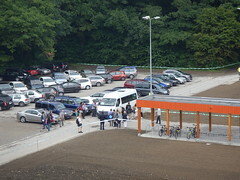 A welcome area was set up around tables placed in a sheltered area under the roof joining the two buildings where trucks usually unload their cargo. 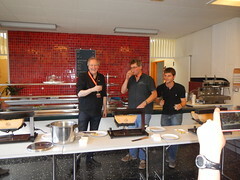 The open house day ended with a Raclette served to all staff members who participated in that special day.